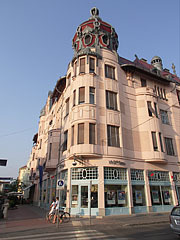 Built between 1913-1930, architects: Frigyes Schulek and Ernő Foerk. 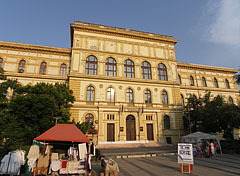 The neoclassical building was designed by Antal Steinhardt and Adolf Láng, it was opened in 1896. 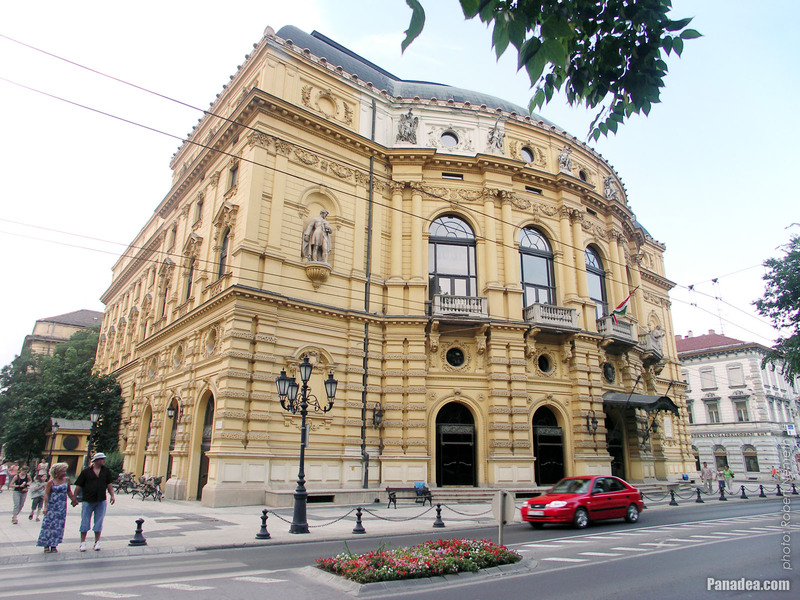 It was built in 1857 by the plans of Károly Gerster. 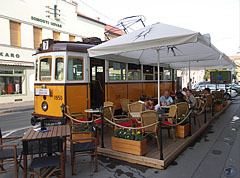 The restaurant terrace of this cozy café and bar was created in the former tram stop of the line 7. 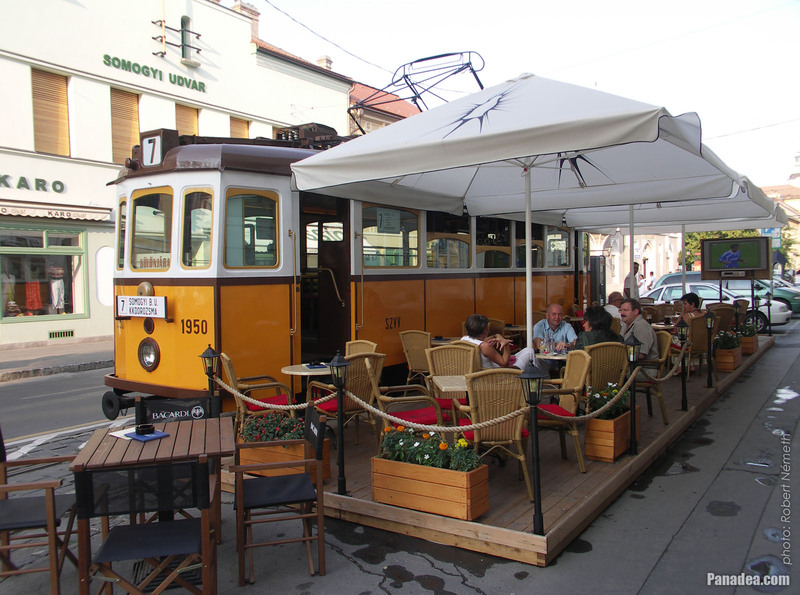 Moreover, there is a bar counter in the old tram car. 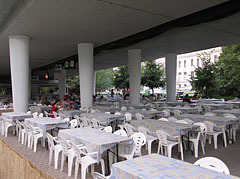 This is a part of the restaurant is opened only in summer. 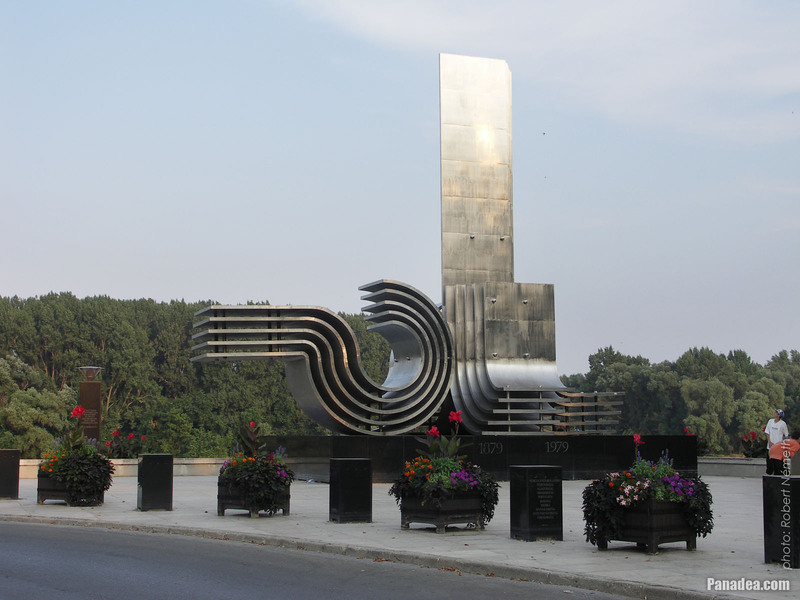 Designed by István Tarnai, it was built in 1979 for the 100th aniversary and in memory of the great flood of the Tisza River. 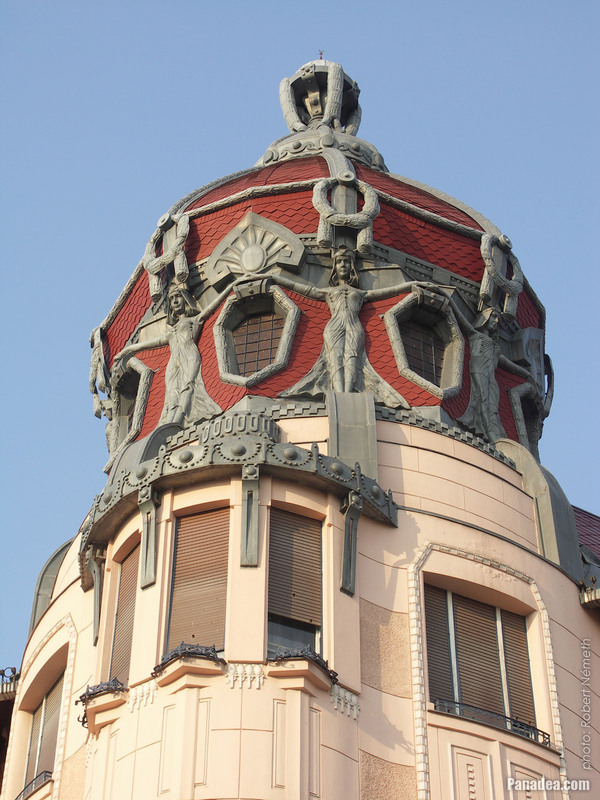 The tinplate statues of female dancers standing around the dome were made by Sándor Varga, and placed onto the building just later. The sculpture was inaugurated on the 100th anniversary of the great spring flood of the Tisza River in 1879. 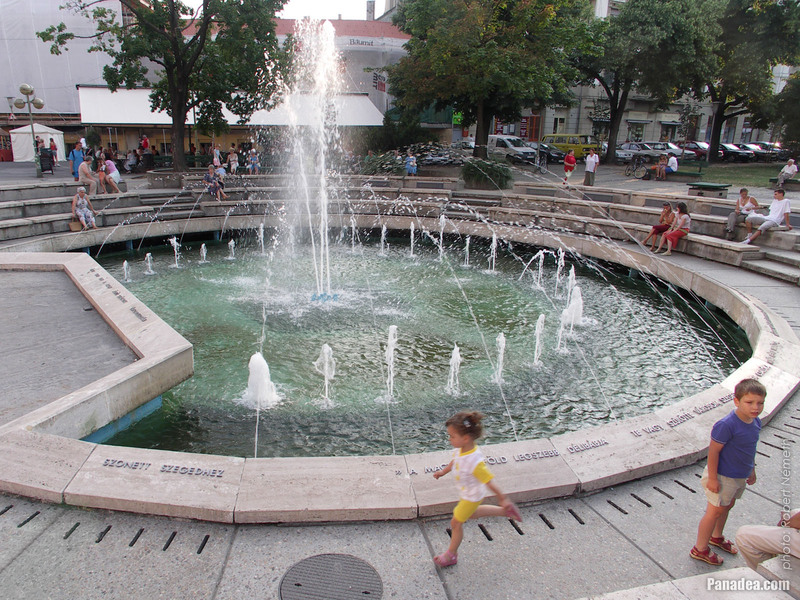 On the black stone cubes there are names of such cities, which gave the most help to Szeged after the disaster. 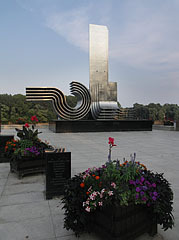 Created by András Lapis in 1975, inaugurated here in 1992. The sculpture tributes to the legendary 6:3 victory of the Hungary national football (soccer) team in England in 1953. 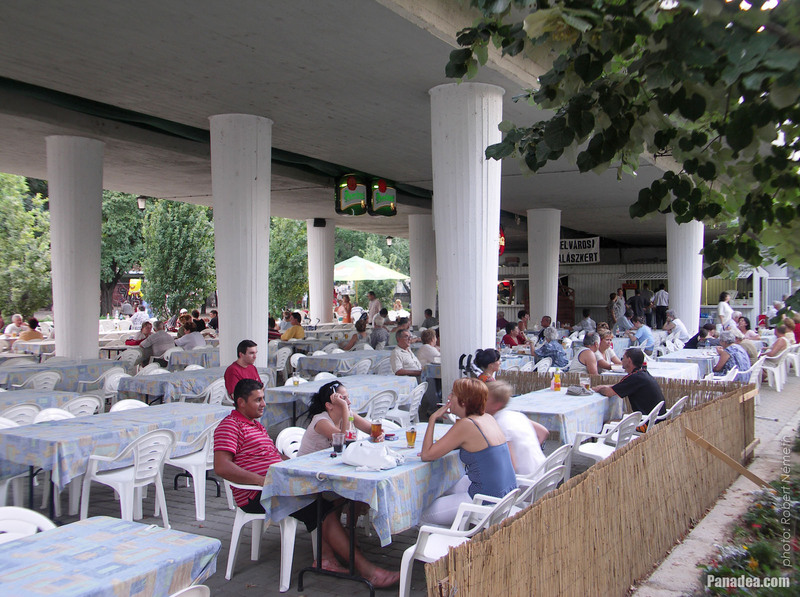 Created by Márton Kalmár in 2003. 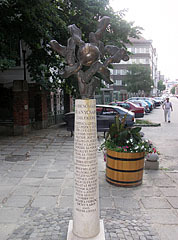 Created by the Munkácsy-awarded Hungarian sculptor Zsuzsa Lóránt in 1992. 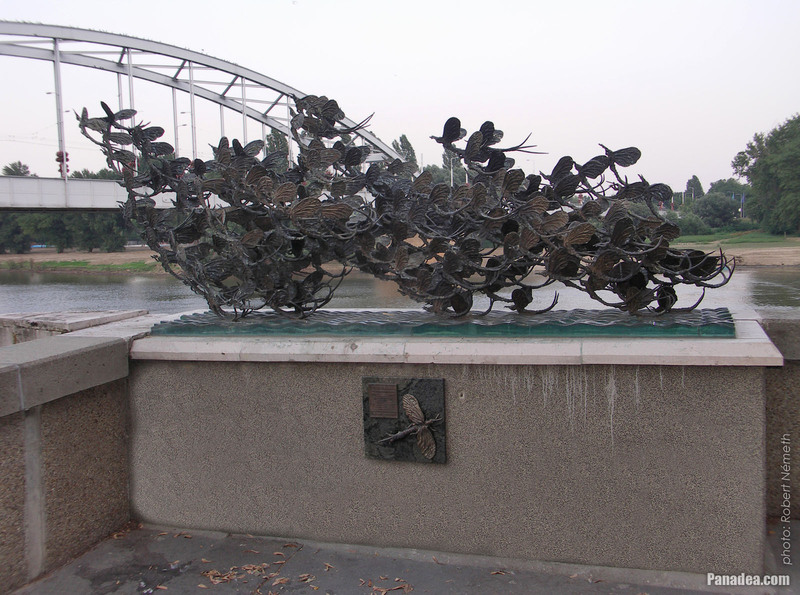 The bronze and glass sculpture was created Pál Farkas in 1998. 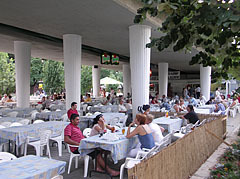 The terrace belongs to the Roosevelt Square Fish Tavern or "Sótartó" Restaurant, it is opened only in summer. 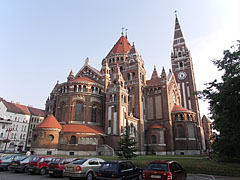 It was built in 1883, designed by Gyula Pártos and Ödön Lechner. 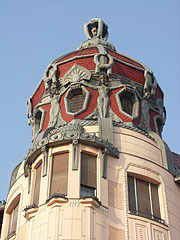 Due to its color sometimes mocked as "Strawberry House" (in Hungarian "Eperház"). 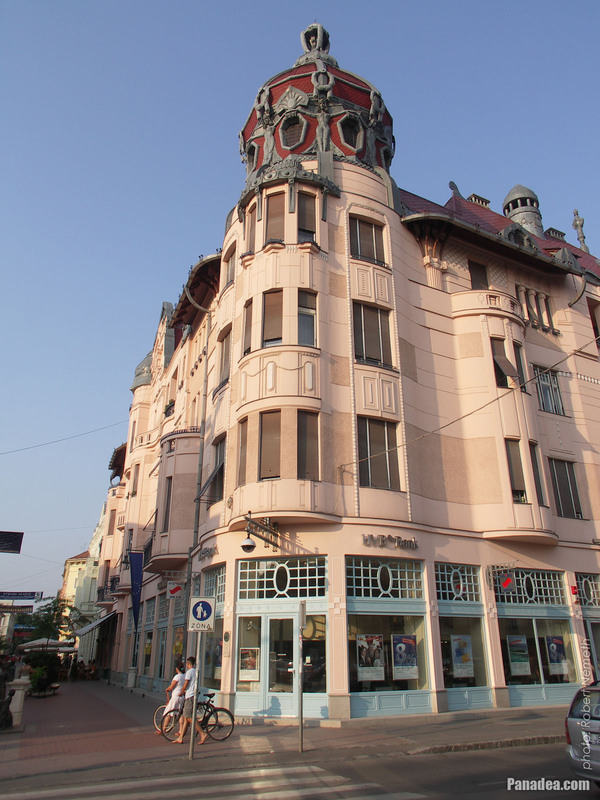 Designed by the Fellner & Helmer architecture studio, built in 1883. 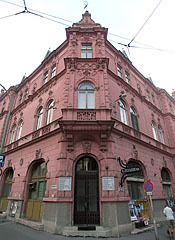 Soon it was burned down, then rebuilt in 1886. 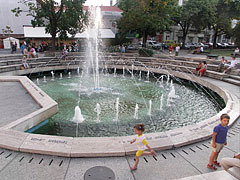 Its most recent renovation was done in 1986. 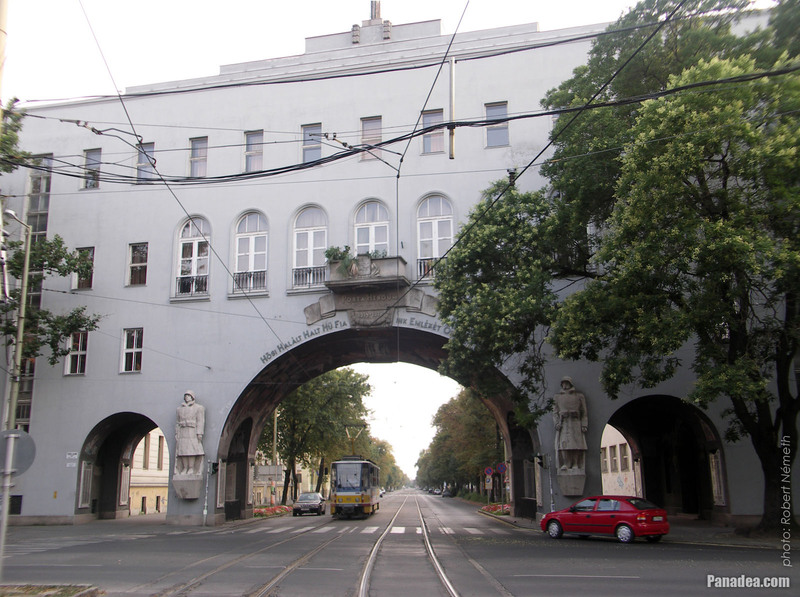 Built in 1883 by the company of Ferdinand Fellner and Hermann Helmer (it was situated in Vienna). 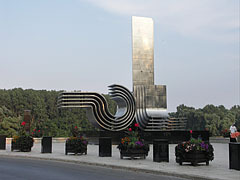 Created by Miklós Melocco in 1996, inaugurated in 2000. 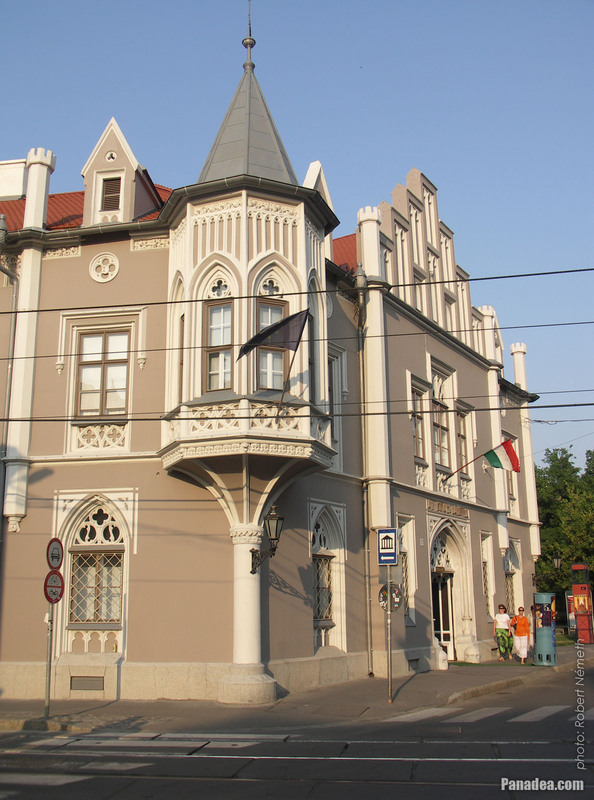 There is a so-called Black House (in Hungarian "Fekete-ház") in Szeged downtown, also known as the "Pilvax of Szeged". The latter name was given by the Hungarian poet Gyula Juhász and it refers to the famous Pilvax Café in Budapest. 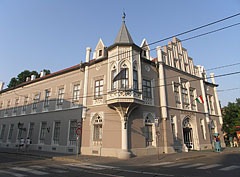 The building was dark gray colored in the past, the former name ("Black House") stuck to it in those times. 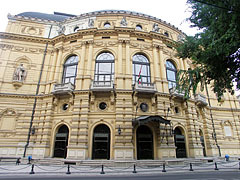 In the 19th century the Downtown Casino was operated within its walls, and in the early-20th century among others there was a newspaper editorial office here. 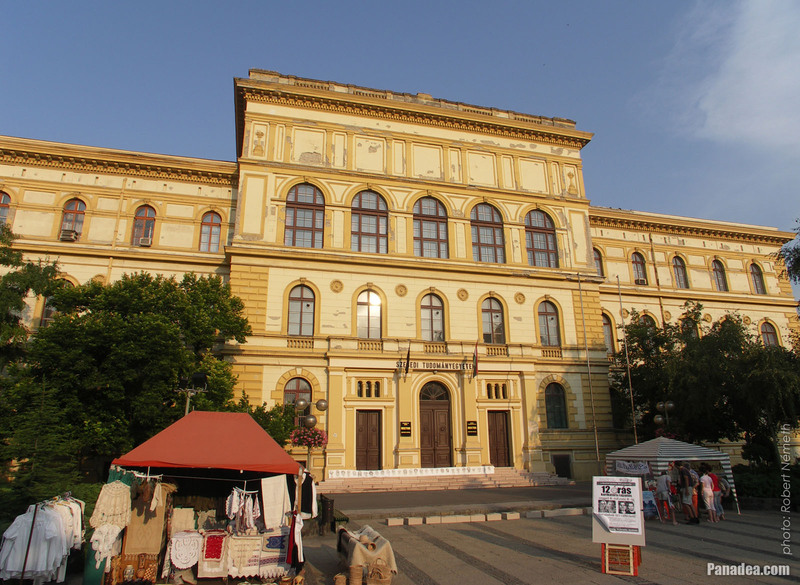 Today there are literary history and applied art collections of the Móra Ferenc Museum here, since 1985. 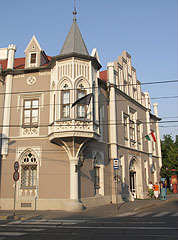 The Black House was built in 1857 in romantic (English gothic revival) style, designed by Károly Gerster. 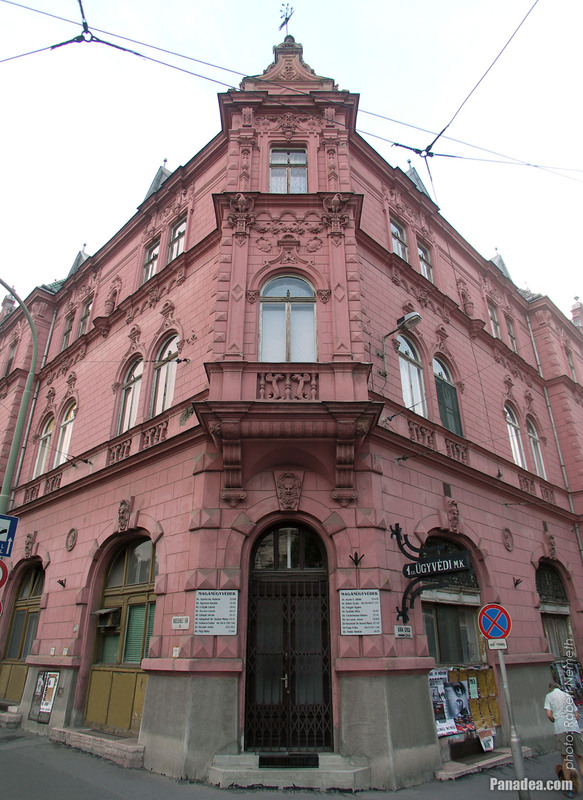 One of the few historical buildings of Szeged that survived the Great Flood of the Tisza River in 1879. 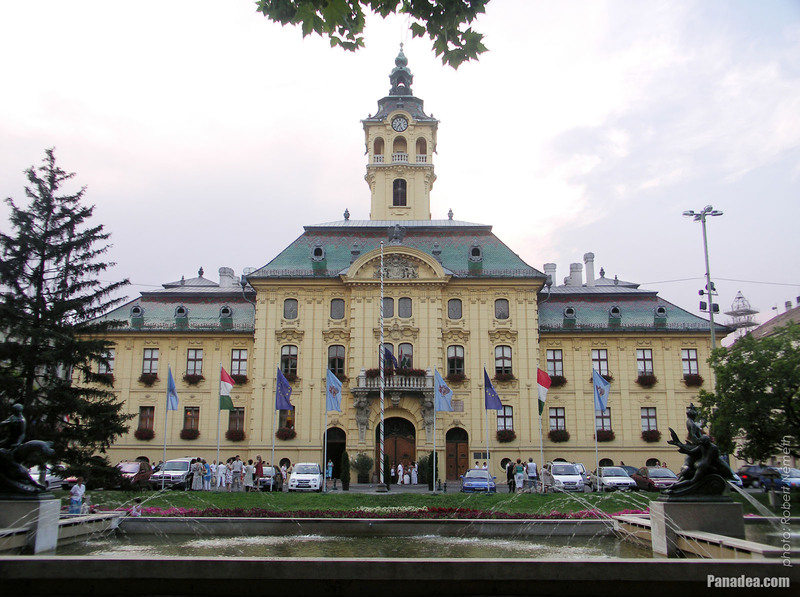 The University of Szeged (in Hungarian "Szegedi Tudományegyetem") was established during the higher education institution mergings in 2000, when another university and three colleges were joined to the József Attila University. These institutions were concretely the Albert Szent-Györgyi Medical University (SZOTE), the College of Food Technology and Engineering of Szeged (SZÉF), the Gyula Juhász Teacher Training College (JGYTF) and the College of Agriculture of Hódmezővásárhely (DATE-MF) that belonged to the University of Agricultural Sciences of Debrecen. 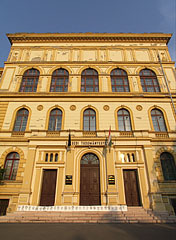 The direct legal predecessor of the Szeged University is the Franz Joseph Hungarian Royal University of Kolozsvár (in Hungarian "Kolozsvári Magyar Királyi Ferenc József Tudományegyetem") that was established in 1872. 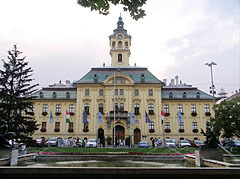 However, the earliest predecessor of it was the Jesuit College of Kolozsvár, founded by István Báthory (Stephen Báthory) in 1581. 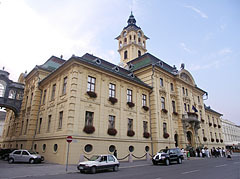 After the World War I the whole vast territory of Transylvania (Erdély) and the Partium was acquired by Romania, including Kolozsvár (in Romanian Cluj-Napoca, in German Klausenburg). In 1919 the Romanian army simply deported the Hungarian teachers and professors from the university buildings of Kolozsvár. 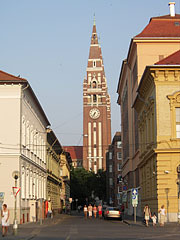 That was the first time when the institution moved to Szeged, where it was operating between 1921-1940. When in 1940 Germany and Italy accepted the so-called Second Vienna Award, the northern part of Transylvania and Kolozsvár city became the territory of Hungary again, at least for a while. 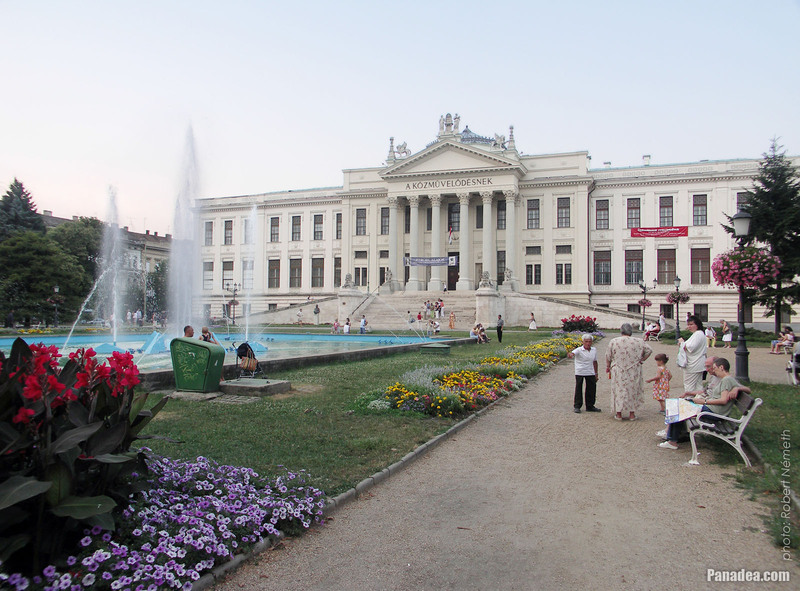 A part of the university moved "home", the other part stayed in Szeged. After all, in 1944 Kolozsvár came under Romanian and Russian (Soviet) occupation again, but now the teaching staff didn't flee back to Hungary and accepted their fate together with other Hungarians in Transylvania. 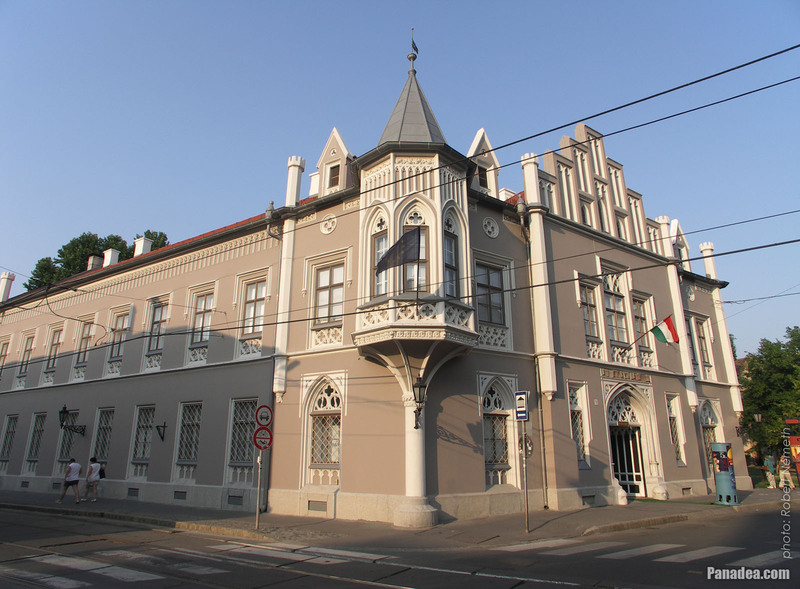 Moreover, anti-Jewish measures were entacted in Hungary and the professors profoundly disagreed with, so it also confirmed their decision for themselves. 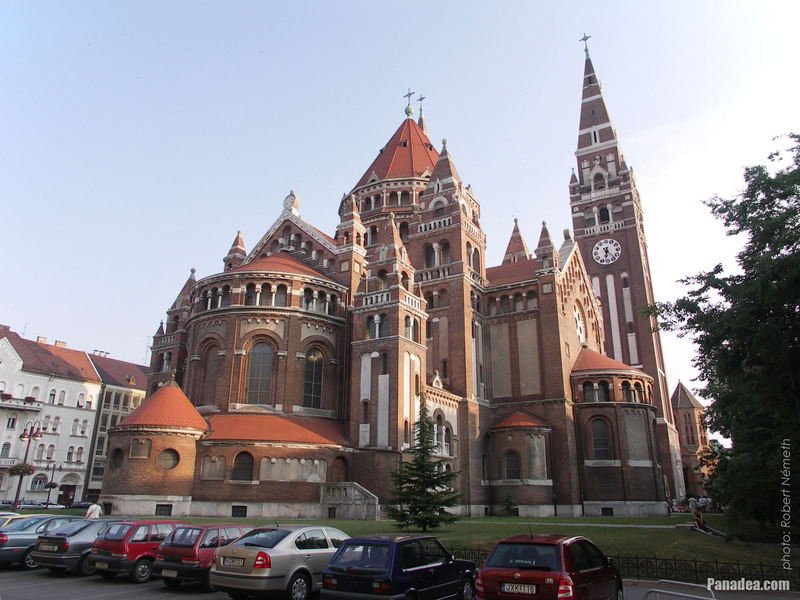 At the end of World War II in 1945 finally whole Transylvania was returned to Romania, and the Hungarian university there was discontinued without a legal successor. However, the state of Romania established the Bolyai University, which offered study programmes in Hungarian, and also employed the teachers and professors of the former Hungarian university. 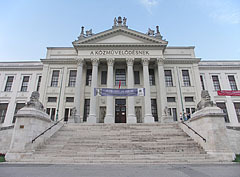 Despite the protests of the Hungarian teachers' community in 1959 it was joined with a Romanian-language university and this is how the present-day Babeș-Bolyai University (in Hungarian "Babeș-Bolyai Tudományegyetem") was formed. 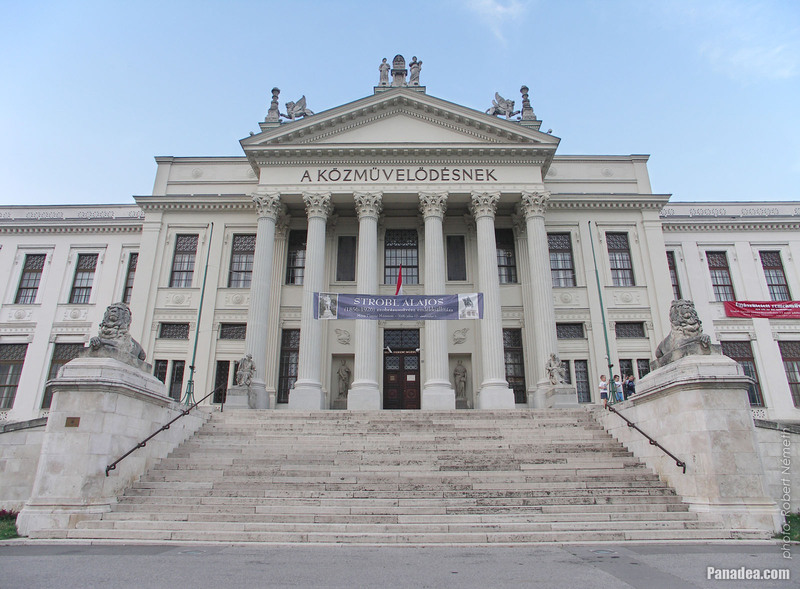 After some time they began to push back the Hungarian-language faculties, but after 1989 this trend was reversed and the Hungarian-language study programmes started to slowly grow again (together with for example the number of the Hungarian teachers as well). 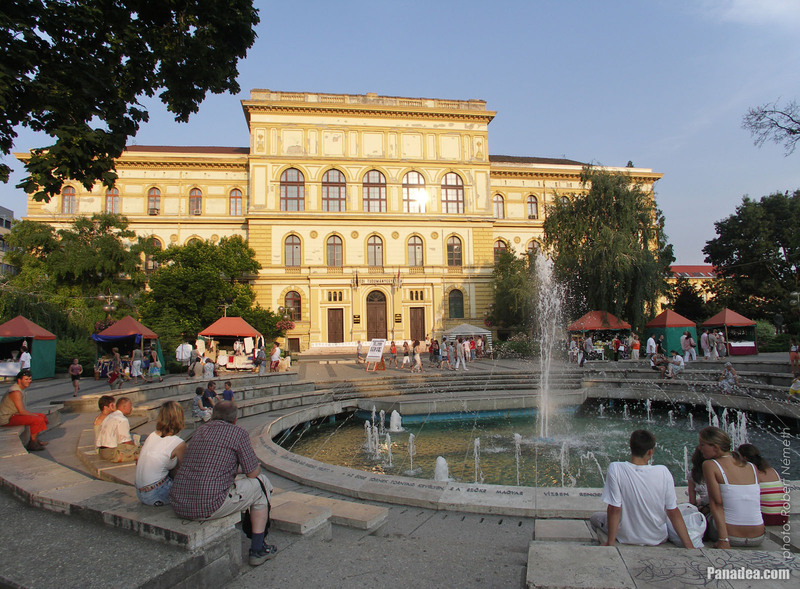 By around 2009 there were 61 study programs with approximately 7,400 students who studied in Hungarian language (just for comparison, at the same time there are ca. 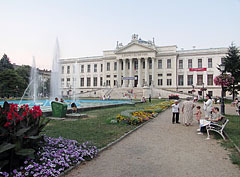 43,000 students in the Romanian section of the institute). 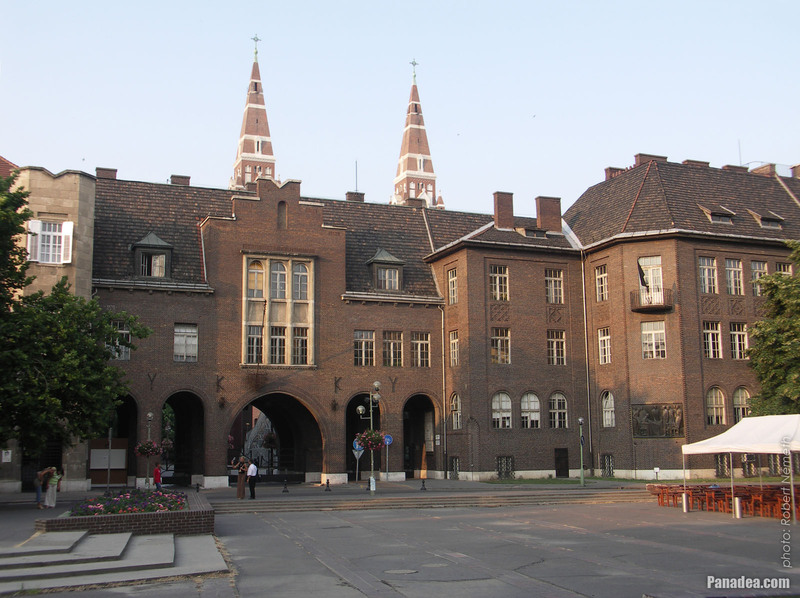 Returning to the Szeged University topic, after the World War II the university continued to function, between 1961 and 2000 it was called József Attila University (in Hungarian "József Attila Tudományegyetem" or JATE). 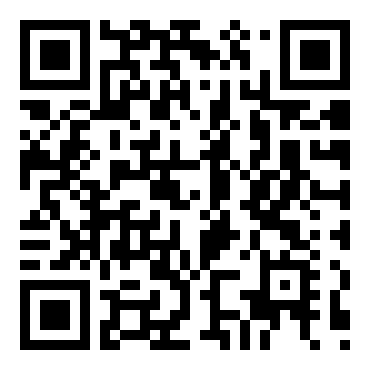 Today it has more than 33,000 students, as well as 6,600 teachers and professors. In 2013 a life-size bronze statue of Albert Szent-Györgyi was inaugurated in front of the Rector's Office building of the University Of Szeged ("Szegedi Tudományegyetem"). 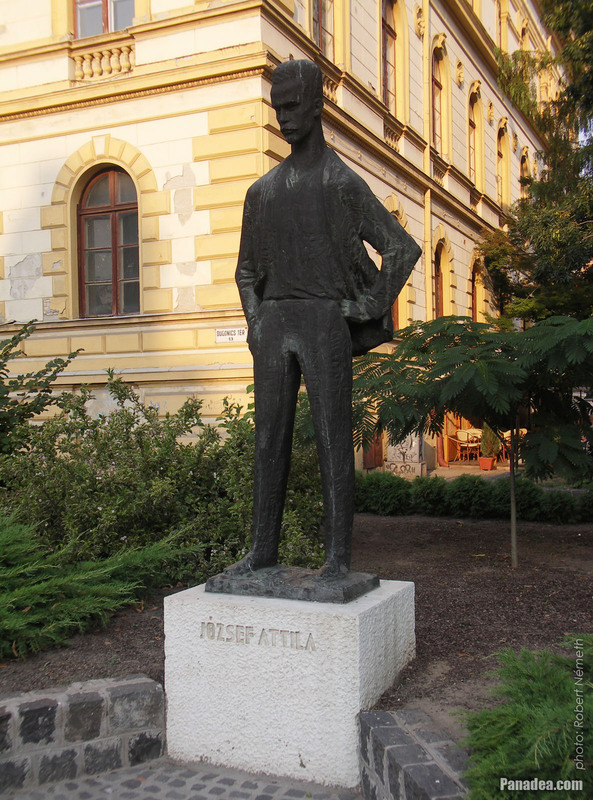 The statue was created by Lajos Bíró Hungarian sculptor, placed on the stairs near the front door. 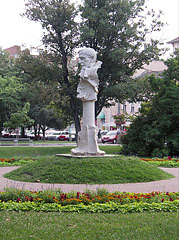 The Hungarian biochemist Albert Szent-Györgyi received the Nobel Prize in medicine and physiology, among others for the discovery of the vitamin C and vitamin P. In 1939 when the World War II was broke out he sold the Nobel Prize plaquette to the Hungarian National Museum ("Magyar Nemzeti Múzeum"), and he offered the received amount of money for the people of Finland who suffered in the Soviet-Finnish War (the so-called Winter War). Interestingly Albert Szent-Györgyi is the only one from the sixteen Hungarian or Hungarian-born Nobel Prize winners, who received the recognition after an activity that was conducted in Hungary. 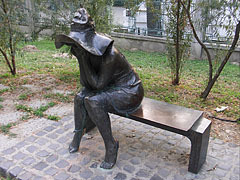 The bronze statue that represents a female figure wearing a hat and sitting on a bench was created by András Lapis in 1992 (originally in 1975). 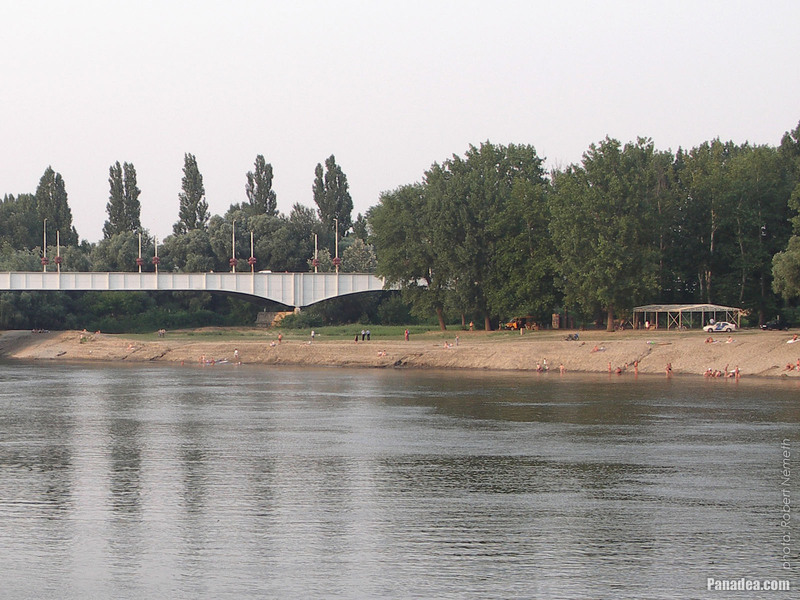 It is called "Under the hat" and situated on the riverbank of Tisza bank in Szeged. The public artwork also has a replica in France, it is located on the street in front of the Hungarian Institute of Paris, also known as Balassi Institute (in French "Institut hongrois de Paris" or "Institut Balassi", address: 92, rue Bonaparte 75006 Paris). 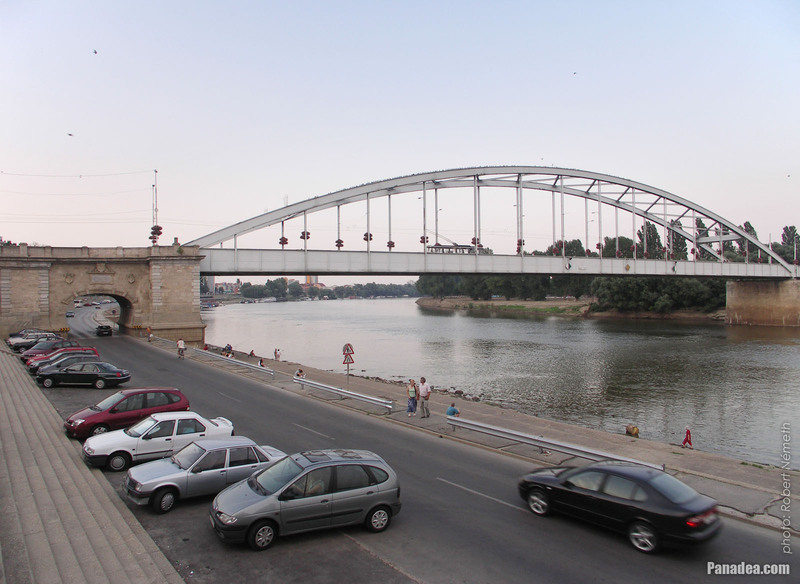 The three-span 147-meter-long Belvárosi Bridge ("Downtown Bridge") over the Tisza River was originally built in 1883, designed by the Hungarian János Feketeházy and the French Gustave Eiffel architects. 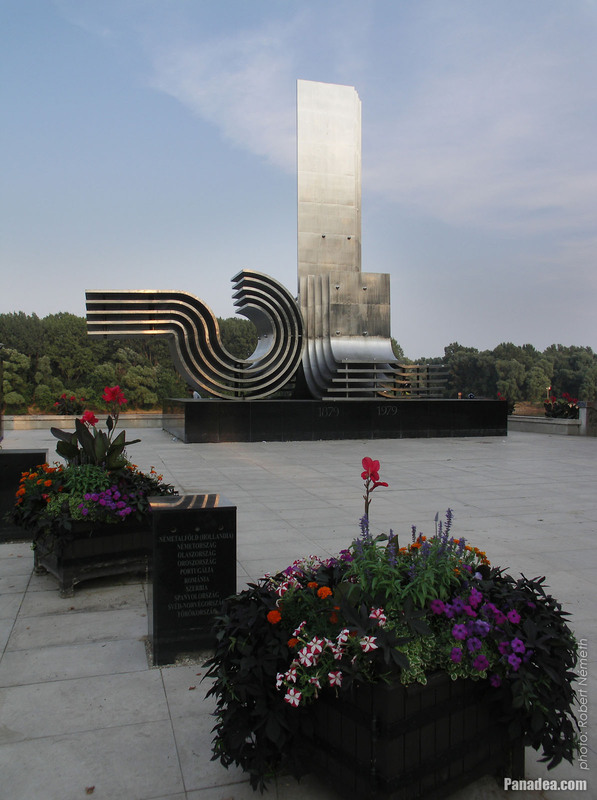 Towards the end of World War II in 1944 the retreating German troops blown it up to slow down the approaching Russian (Soviet) army. 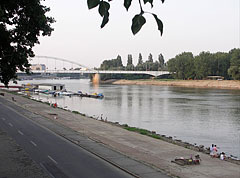 Because After the war firstly wreckage had to be removed from the river, so the construction of the new bridge could be started only in 1947, by the plans of architect Győző Mihailich. 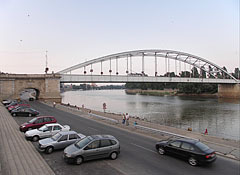 The new Belvárosi Bridge was finally opened for the traffic in 1948. Since 2004 the clock tower (or clock turret) on the City Hall of Szeged also contains a WiFi (Wireless Internet) aerial or antenna. 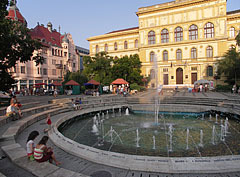 This so-called WiFi hotspot provides free internet access with bandwidth of 1.5 Mbits (as of 2014) around the Széchenyi Square. 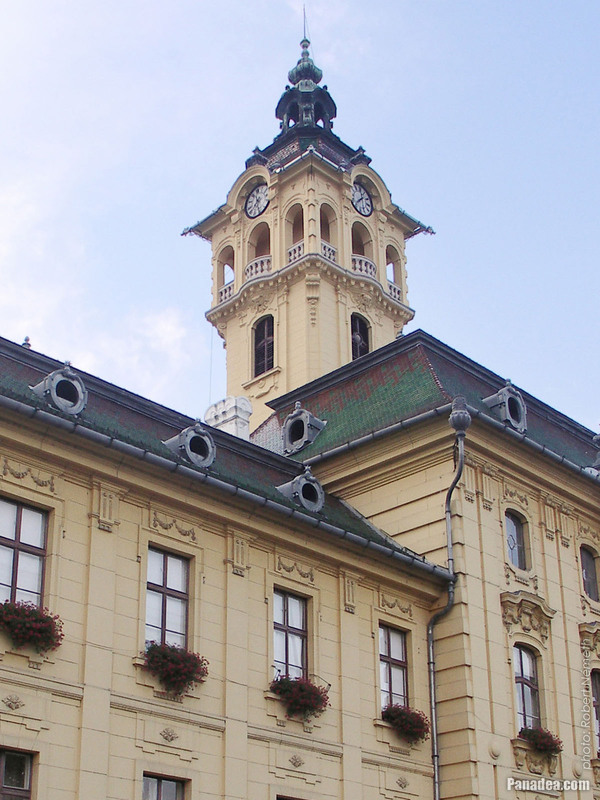 The gorgeous City Hall of Szeged (in Hungarian "Városháza") was built originally in 1728, and first modified in 1804 by the plans of István Vedres. 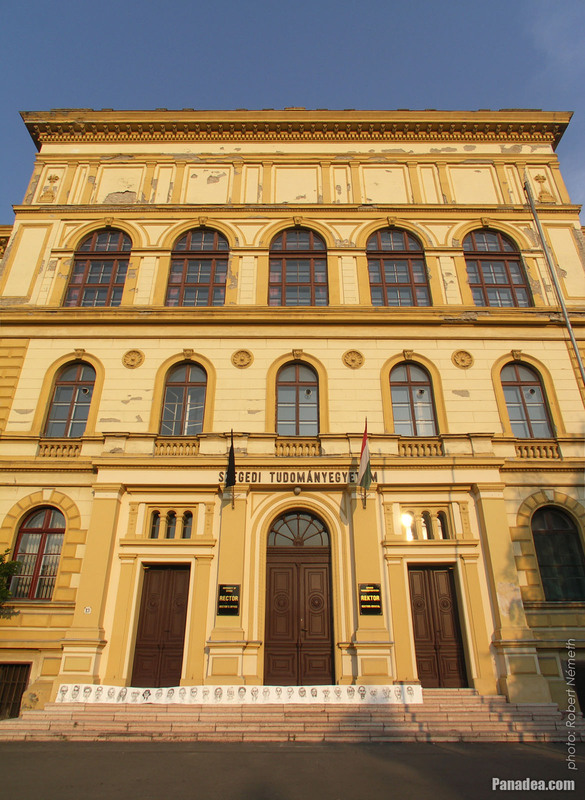 After the Great Flood of River Tisza in 1879 it was one of the few buildings of Szeged that survived. 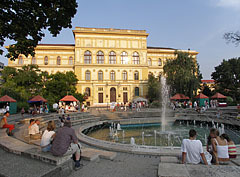 In 1883 it was rebuilt by the plans of Ödön Lechner and Gyula Pártos, now in neo-baroque style. The so-called "Bridge of Sighs" (in Hungarian "Sóhajok hídja") is located on the left side of the City Hall and connects it with the neighboring building, it was built also at that time and inspired by the well-known bridge with the same name in Venice. 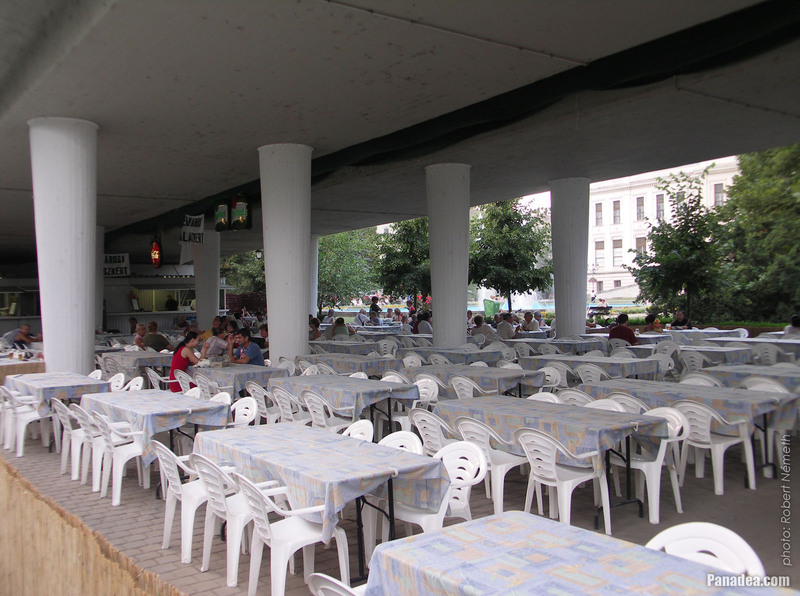 Interestingly the current ground floor of the building was originally the basement level. 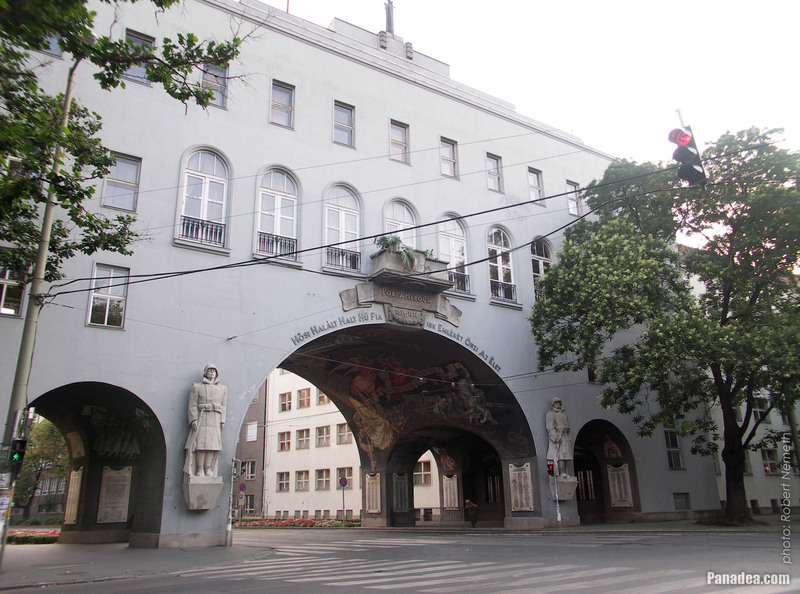 The Heroes' Gate ("Hősök kapuja") in Szeged is a World War I monument, preserves the memory of the 12,000 soldiers from Szeged who died in the war. It was built between 1936-1937, designed by Móric Pogány. 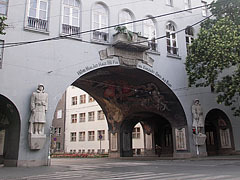 There are more independent art pieces on it, for example the large full-figure limestone soldier statues on the two sides of the arched gate which are called "Monument of the living and the dead soldiers". 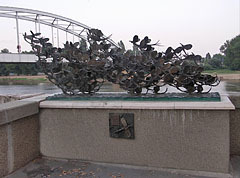 The "dead" soldier is on the left and the living one is standing on the right. These statues were created by Éva Lőte in 1937. Ander the arch there is a mural from Vilmos Aba-Novák painter, at the time of the making it was the largest wall painting in Hungary. 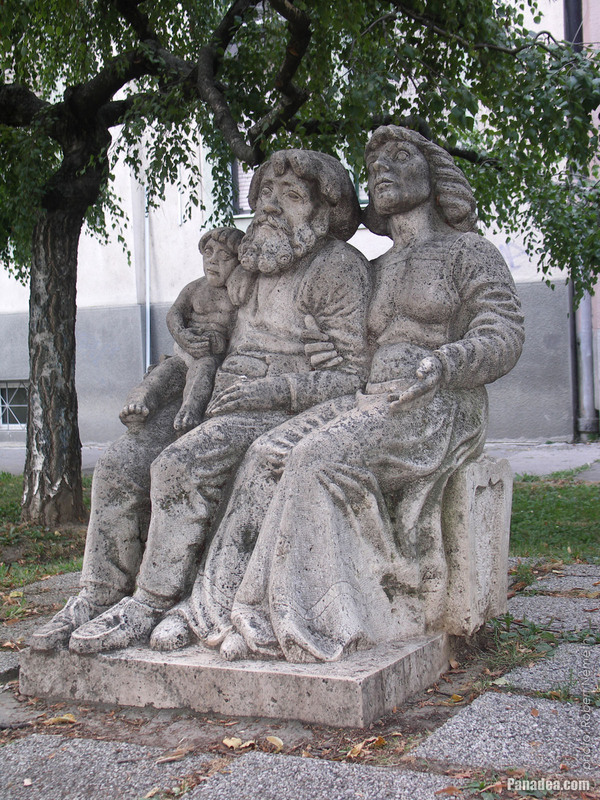 Because both the religion and Regent Miklós Horthy were included in the theme of the picture, in 1949 the communists simply have it covered with plaster. 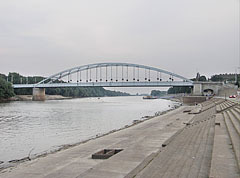 After some earlier surveys and examinations the restoration works was begun only in 1996. This was a big challenge for the conservator-restorers, because during the restoration it turned out that the murals were almost completely destroyed by the cement plaster, about 60-70 percent of them had to be totally repainted. 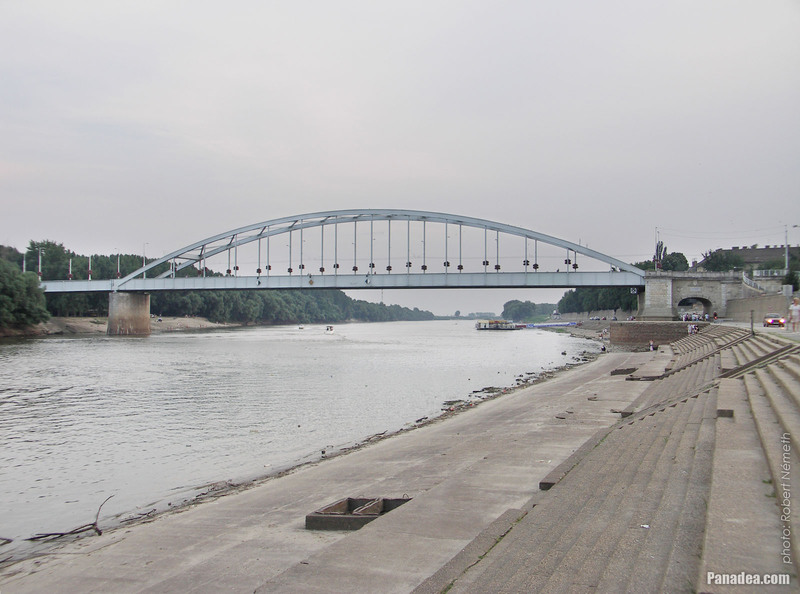 Finally the restoration was completed in 2000. 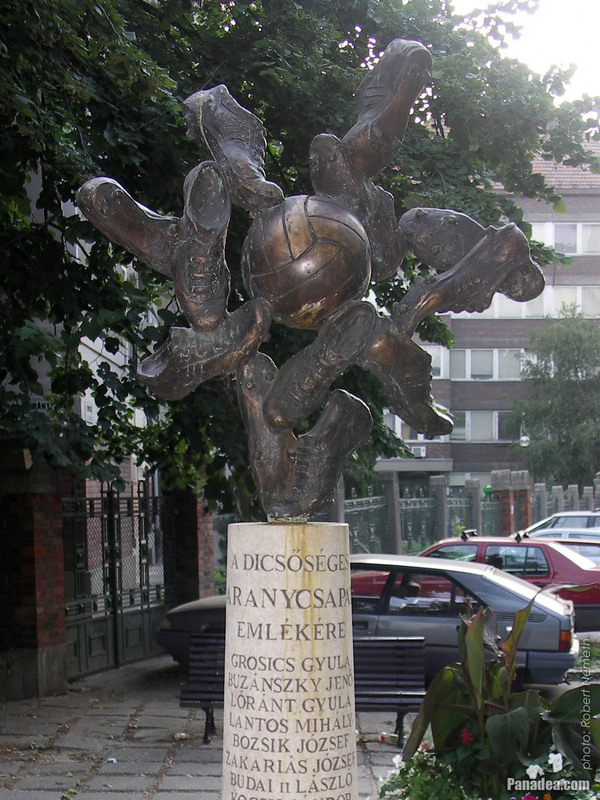 The "Golden Team" (in Hungarian "Aranycsapat", also known as the "Magical Magyars" or "Mighty Magyars") was the nickname of the best, most successful Hungarian national football (soccer) team, which was the Olympic Champion of 1952 and undefeated between 1950-1954. In the World Cup of 1954 in Switzerland they lost only by one goal in the finals from the Germans (and probably it was also due to the referee's fault), so then they won "only" the silver medal in the World Championship. Their best known victory was on 25 November 1953 in the Wembley Stadium in London, in front of 105 thousands of spectators: England-Hungary 3:6 (2:4 after the first half). The statue on the riverbank of the Tisza was created in honor of this victory in 2003 by the Hungarian sculptor Márton Kalmár. 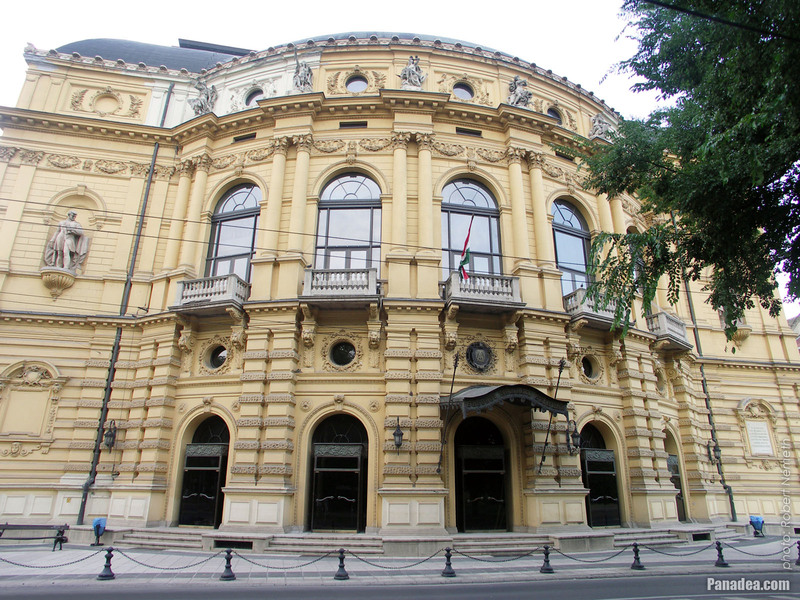 The rematch of the 6:3 was played on the field of the Népstadion (literally "People's Stadium", it was built in 1953, today Ferenc Puskás Stadium) in Budapest, where the "Mighty Magyars" won against England even more superciliously, the result was 7:1 for the Hungarians. By the way, the highest number of spectators in the Népstadion was at the Hungary-Austria match in 1955: there were 104 thousand people in the stadium, although at that time there were standing places as well. 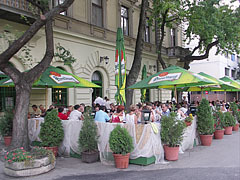 The manager of the team was Gusztáv Sebes.